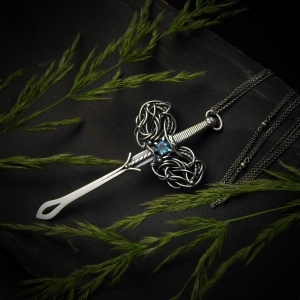 Unique pendant in a shape of a sword adorned with a stunning diamond cut blue topaz and hanging on a subtle long chain. The piece was made in oxidised and polished fine and sterling silver. The pendant is 9,4cm long (not incuding the bail) and 4,4cm wide. The chain is 80cm long + 10cm of extension.